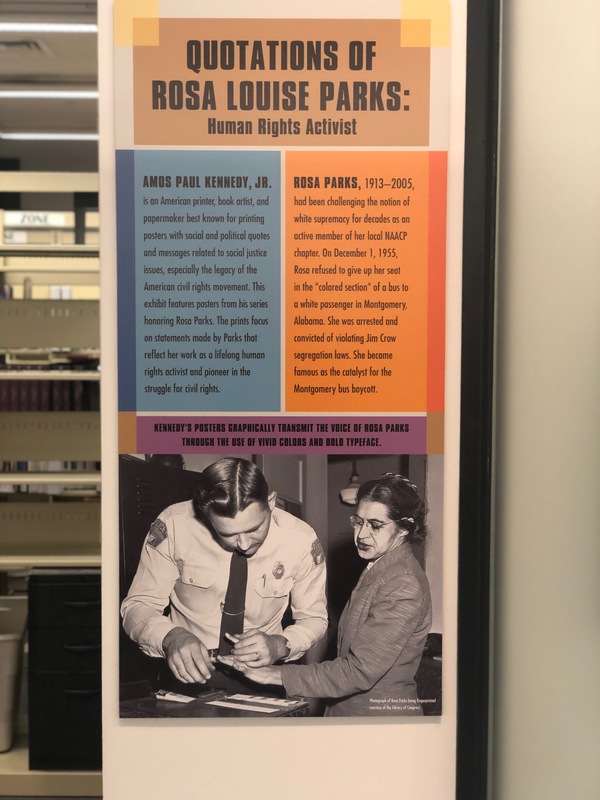 In celebration of Black Heritage Month and the birthday of human rights activists Rosa Parks, the college is currently hosting an exhibition of prints by Amos Paul Kennedy, Jr. that highlight statements made by Parks about segregation. The exhibition is titled “Quotations of Rosa Louise Parks: Human Rights Activists” and is located at the Lass Gallery in Skillman Library from Jan. 28 to July 3. Parks became a well-known figure of the civil rights movement in Jim Crow America after she refused to give up her bus seat to a white man in Montgomery, Ala. That day, Dec. 1, 1955, Park was arrested and convicted for violating segregation laws, which led to her losing her job as a seamstress. After her arrest, leaders of the local black community organized a bus boycott, which was led by Martin Luther King Jr.
Park was born in Tuskegee, Ala., on Feb. 4, 1913 and died Oct. 24, 2005. Kennedy’s exhibition consists of multiple quotes by Parks, including, “All I was doing was trying to get home from work,” “The only tired I was, was tired of giving in,” and “Our mistreatment was just not right and I was tired of it,” among many others. Kennedy is a printer, book artist and papermaker known for “printing posters with social and political quotes and messages related to social justice issues, especially the legacy of the American civil rights movement,” according to the exhibition biography. The college is hosting other events in honor of Black Heritage Month including a talk by co-founder and former chairman of Black Panther Party Bobby Seale on Feb. 12, a panel discussion titled “Black When Shakespeare Was Black: A Panel Discussion on Teaching Race” on Feb. 19, and a talk called “The Brothers of Lafayette BHM Lecture: Cross-Generational Experiences of Black Male College Students,” which will be given by Dean of Students Chris Hunt and Charles Evans ‘19.